TO PORT OPERATIONS. The Raritan Express Shuttle will benefit the entire Port Authority region by removing as many as 300 to 350 overweight containers from public roads on a daily basis. This will reduce highway and terminal congestion, increase on-dock container throughput, and eliminate expensive and time consuming permitting procedures. The operation will also allow the Port Authority to convert on-dock warehousing space into the larger container grounding areas needed when handling today’s modern vessels. TO SHIPPERS. The Raritan Logistic Center’s extensive selection of on-site services will offer shippers multiple logistics options in one single location. Direct access to I-95 (New Jersey Turnpike), I-287, and Routes 1, 9, 514 and 440 will provide rapid and safe distribution to a wider marketplace. The entire operation will also benefit from on-site police and fire facilities that will offer a level of protection and quick response time found at no other logistics facility. TO THE ENVIRONMENT. 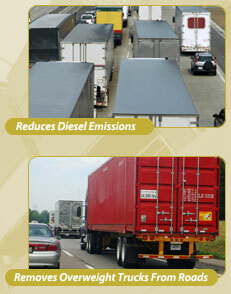 The elimination of hundreds of trucks from urban roadways and neighborhoods each day will help to improve the air quality for New Jersey’s waterfront area residents and workers through the reduction of emissions and other greenhouse gases - especially diesel particulates.